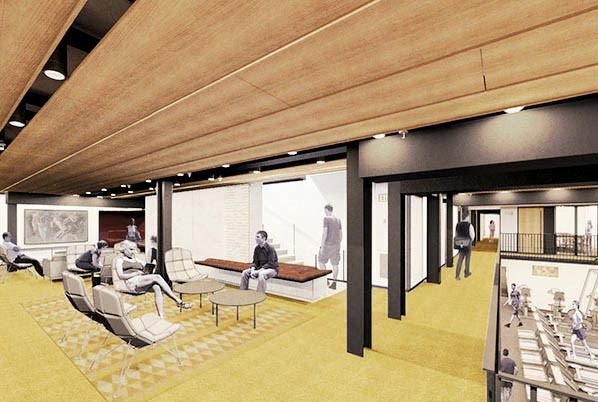 Dunster, the first undergraduate residence scheduled for a complete overhaul as part of House renewal, will feature enhanced social, arts, and exercise spaces, and a contemporary classroom, as shown in these renderings released in late January. Construction, which is scheduled to last for 15 months, will begin immediately after Commencement. In recent financial reports, the University has emphasized the importance of reining in burgeoning compensation costs, particularly for employee benefits (for instance, see “Fiscal Portrait,” January-February, page 28, for the 6 percent rise in benefits costs during fiscal 2013)—a point for protracted bargaining with some of Harvard’s unions. Such costs have not been adjusted for growth in the workforce, on which data are now available. From a low of 15,203 full-time-equivalent faculty and staff members during 2009, in the wake of the financial crisis and cost-cutting, Harvard’s census has risen each subsequent year, to nearly 16,600 last October. Benefit costs per employee do rise—as healthcare expenses increase beyond changes in plan terms, payroll taxes expand with higher salaries and promotions, and so on. But given annual employment growth averaging 2 percent in recent years, the per capita increase in benefit costs is significantly lower than the aggregate figure. The Graduate School of Design has received a $10-million gift from John K.F. Irving ’83, M.B.A. ’89, and Anne Irving Oxley in honor of their father, John E. Irving; they had previously endowed a professorship in landscape architecture. The gift endows fellowships, research funds for junior professors, and research in landscape architecture; it also supports funding for innovations, the undergraduate architecture concentration, and Gund Hall renovations. John K.F. Irving will chair the school’s campaign.…Media-industry leader Sumner Redstone ’44, LL.B. ’47, has donated $10 million to Harvard Law School, to fund postgraduate public-service fellowships.… Separately, Harvard Medical School is one of six research institutions each to receive a $90-million endowment from Ludwig Cancer Research; it will support work on the disease’s resistance to therapy (see “$90 Million for HMS Cancer Research.” Days later, Weill Cornell Medical College announced a $75-million gift for cancer research and care, and the University of Southern California (in the middle of a $6-billion capital campaign) unveiled a $50-million gift toward a 190,000-square-foot bioscience, engineering, and medical research center.…On January 20, Columbia president Lee C. Bollinger announced that its campaign, launched in 2006, had concluded with $6.1 billion raised—including $1 billion for financial aid, a like amount for facilities, and more than 260 endowed professorships. The U.S. Department of Agriculture has cited Harvard Medical School (HMS) for 11 violations of the Animal Welfare Act from early 2011 through mid 2012—four of which resulted in the death of primates—and levied penalties of $24,036. Many of the problems have been previously reported (see “Animal Research Reforms,” May-June 2012, page 45). HMS announced last April that it would close the New England Primate Research Center, in Southborough, its principal venue for animal experiments; it cited financial pressures on research as well as the estimated large capital cost of renovating the facility (see “Harvard Medical School to Close Primate-Research Center”). The National Science Foundation has funded a Center for Spatiotemporal Thinking, Computing, and Applications (www.stcenter.net) to support research and development of solutions to large challenges where spatiotemporal analyses could be decisive (in climate change, reduction of risks from natural disasters, and so on). In addition to business and government-agency partners, the collaborating schools, to date, are the University of California at Santa Barbara, George Mason, and Harvard—through the Center for Geographic Analysis (http://gis2.harvard.edu—see “Hello, Geotech,” November-December 2006, page 44). The new center’s anticipated research budget is more than $2 million annually, for at least several years. As further evidence of changes in higher education driven by new conditions in the financial and competitive landscapes, Inside Higher Education (IHE) has reported that Haverford College may restrict its no-loan aid packages, at least for students from somewhat higher-income families. Cornell and Virginia have recently announced similar refinements. IHE also reported that Johns Hopkins is discussing larger, longer stipend packages ($30,000, five years, up from $22,000 now) for graduate students, accompanied by reducing graduate enrollment by 25 percent during a five-year period; it is also “leaning junior”—emphasizing hiring junior professors to succeed retiring senior faculty members. 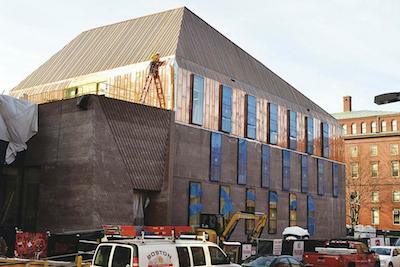 Rebuilt to a LEED gold sustainability standard and expanded by 10,000 square feet, the Tozzer Library building on Divinity Avenue will, this May, help bring together all the sub-disciplines of the anthropology department, as the social anthropologists (now in William James Hall) move in to join the archaeologists in the adjacent Peabody Museum. 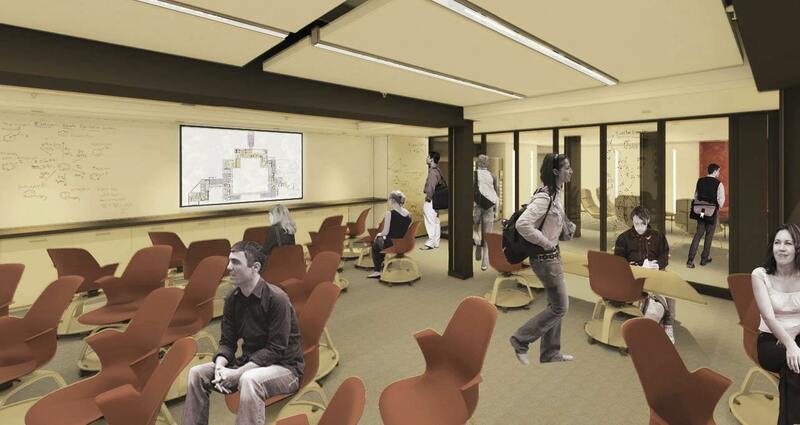 In accord with larger discussions about the changing role of academic libraries, the project has reconceived Tozzer as a series of collaborative spaces, rather than simply as storage for the 54,000 volumes that will remain. Early app avalanche. The College announced in December that 992 applicants from a pool of 4,692 were granted early-action admission to the class of 2018, entering this autumn. During 2011 and 2012—when early action was reinstated after a four-year hiatus—774 and 892 applicants were admitted. Because admitted early applicants have a strong propensity to enroll, members of the regular admissions pool face an extraordinarily low admissions rate—heading toward 3 percent. Total applications were 34,295, down 2 percent from last year. Arts honorand. Novelist and poet Margaret Atwood, A.M. ’62, Litt.D. ’04, returns to campus on May 1 to receive the Harvard Arts Medal during the annual Arts First festival. She was the Radcliffe Medalist in 2003 (see “Democracy: Use It or Lose It”). Making book. Five Harvard affiliates are finalists for National Book Critics Circle awards for works published in 2013; winners will be announced on March 13. They are: Amy Wilentz ’76, Farewell, Fred Voodoo: A Letter from Haiti (autobiography); Leo Damrosch, Bernbaum professor of literature emeritus, Jonathan Swift: His Life and His World (biography); Kevin Cullen, NF ’03, and Shelley Murphy, Whitey Bulger: America’s Most Wanted Gangster and the Manhunt That Brought Him to Justice (nonfiction); Frank Bidart, A.M. ’67, Metaphysical Dog; and Lucie Brock-Broido, a former Briggs-Copeland poet, Stay, Illusion (the latter two both in poetry). Commercial connections. In further signs of Harvard’s interest in business connections and sponsorships, the athletics operations’ affiliation with John Harvard’s Brewery extends into winter-season sports with the “Crimson Pub” offering food and a cash bar in Dillon Lounge before games, at intermission, and post-game. At the School of Engineering and Applied Sciences, the third annual symposium on the future of computation, presented by the Institute for Applied Computational Science on January 24, was underwritten by Liberty Mutual Insurance (platinum), VMware (gold), and Microsoft (the student computational challenge sponsor). The Women Engineers Code Conference was “made possible by” Goldman Sachs, Facebook, Intuit, Rackspace, Google, Qualcomm, Microsoft, and others. And Hasty Pudding Theatricals’ man and woman of the year extravaganzas are now sponsored by Related Companies, the New York-based real-estate developer (with Boston operations). Football facilities. As plans advance to renovate Harvard Stadium (including the addition of 350 enclosed seats and reduction of overall capacity from 30,262 spectators to 22,333), another storied venue is about to be overhauled, too. Notre Dame has announced that it will spend $400 million to add 750,000 square feet of new buildings to the south, east, and west sides of its stadium. The structures will house academic departments; student organizations and recreation and career centers; and up to 4,000 premium seats. Miscellany. Sandra Naddaff ’75, Ph.D. ’83, senior lecturer on literature and comparative literature and director of the freshman-seminar program, has been appointed dean of Harvard Summer School. She served as Mather House master from 1993 to 2010.…Skanska USA, the construction company, has announced a $57-million contract to build Harvard Business School’s Ruth Mulan Chu Chao Center, a replacement for Kresge Hall, part of the executive-education complex at the eastern end of its campus (read full details). Work is to begin in March, and to be completed for Commencement 2016.